Your wedding day is something every girl has dreamed of, the dress, the cake, the venue, the ring, the hair. I understand that your special day needs to be perfect, that you want to look stunning and that your hair style needs to be in perfect harmony with the essence of your wedding day. 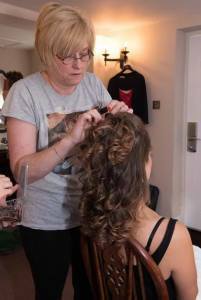 My name's Sarah Wheeler and I have been in the Wedding Hairdressing / Make Up Business for almost 15 years, I specialise in wedding hair and make up and over the years have helped to create many different hair styles to compliment all brides tastes. I set myself apart from the rest by helping to create a style that suits your every need for both the day and the evening reception. Firstly I spend time with you taking notes and asking you questions so we can determine how best to help you make your day go smoothly and carefree. 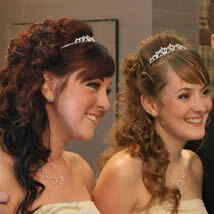 We talk about everything from hair pieces and tiaras to accessories and hair colour. After we have built up a basic profile for you and your bridal party, we set you up with a hair plan that involves hair growth and colouring ready for the big day, then we start your trial. This is where we design and create the right style that will suit you, your image and your dress. On the day we will arrive in plenty of time and will stay as long as we are needed to help keep the stress at bay, so you can sit back relax and enjoy your magical day.